Police in C District are advising both householders and business owners to be vigilant against oil theft following a number of reports of thefts in the Down area recently. Fit an anti-theft device to your oil tank. A spokesperson said: “As an expensive commodity, heating oil is very attractive to thieves. It therefore makes good economic sense for people to protect themselves and their neighbours against this type of crime which hits the most vulnerable in our community the hardest; the elderly people who need heat and warmth to stay well and families who often struggle to meet rising fuel costs. “We would urge everyone to follow these simple steps to help prevent oil thefts. * Lock your gates: The simple act of keeping your garden or drive gates closed and securely locked can prevent a theft. Ensure that all gates and fences are in good repair. However, please bear in mind that the oil company will need access to your property to fill your tank on delivery day. * Disguise your tank: Consider fencing, trellis and defensive planting. The planting of thorny bushes around your tank and boundaries can provide extra protection. Planting should not hinder the oil delivery person. Good examples of defensive plants are Pyracantha, Berberis, Climbing Roas, Hawthorn and even Gooseberry. * Create obstacles: Plant pots and general garden paraphernalia can be placed in the path of any potential intruders. They will make noise and waste time moving the items or navigating around them. You would still need to ensure an access route for deliveries. Remove and secure any tools or ladders which could be used as an aide to commit crime. 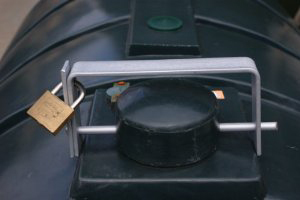 * Lock your tank: Use a good quality, alarmed padlock or install lockable caps with crop-proof fittings. Where possible fit hardened flexible casings, to any vulnerable fuel hoses, so that they are harder to cut. Remember to unlock your tank for deliveries. * Anti-tamper ‘Commander’ device: A new, anti-tamper device called a ‘Tank Commander’ can be used to raise an alarm and alert your mobile phone when a possible theft occurs. Further details can be found by searching online for ‘Commander Securities’ or asking a local Crime Prevention Officer by calling 101. * Industrial or farm tanks: Can be protected using a Commander device. Other factors to consider include a protective cage, improved fencing and a review of general yard lighting, CCTV and working practices. A local Crime Prevention Officer can offer further advice – please contact 101. * Lighting: Consider fitting sensor lights to brighten up dark areas around your home, particularly areas around the oil tank. * Be a good neighbour: Check on elderly neighbours or relatives who could be vulnerable to this type of crime. “People should be on the lookout for any activity that is out of the ordinary in the local area. Particular attention to any lorries, vans, and cars towing trailers laden with containers that would be capable of transporting oil. Most oil distributors advertise their company on their delivery vehicles. We take all reports of suspicious activity very seriously. “Thieves operate at different times of the day and if you notice anything untoward in your neighbourhood, or see unknown vehicles outside premises, note down any important details such as a description or vehicle registration and contact police immediately on 999. Officers will follow up on your call and your prompt information could prevent a crime from occurring. For further crime prevention information, please contact your local crime prevention officer on 101.